This is long all day hike or a backpacking hike that explores a scenic low-elevation Central Adirondack forest, parallels the East Branch Sacandaga River, and visits a large wilderness pond. You'll be following a well worn path to this overly popular destination. 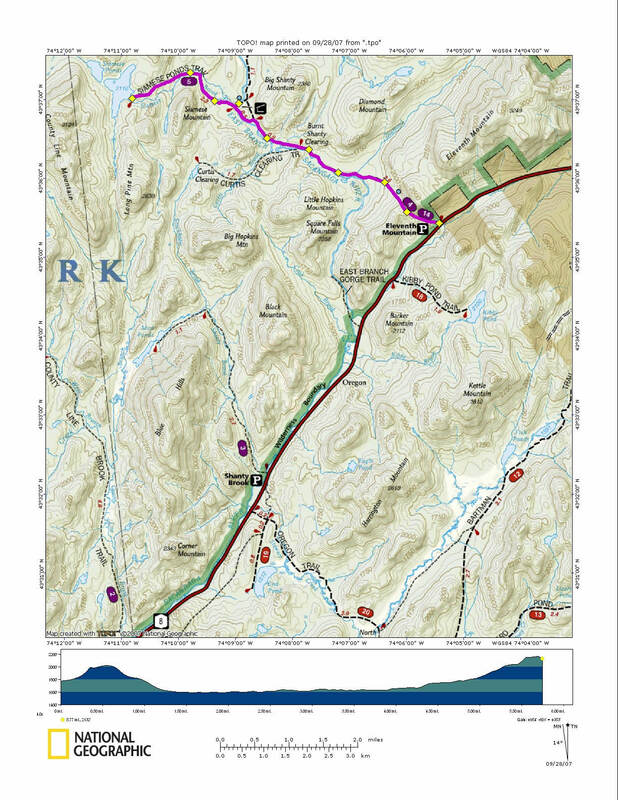 The trailhead is located off NY 8, west of Speculator and north of Wells, on the way toward Wevertown. The GPS coordinates are N43 35.446 W74 05.436 for the parking area. The large parking area is known as the Eleventh Mountain Trailhead. It is a 5.9 mile one way hike to Siamese Ponds. You are following blue NY DEC markers on this well worn path. The first part of this hike is a climb on the shoulder of Eleventh Mountain, After the climb the trail drops about 400 feet in elevation as you head toward the East Branch Sacandaga River. Remember that nice descent for your return trip, as you will be climbing on your way back to the trailhead. There is a bridge over Diamond Brook.